The introduction of the AFDX® (Avionics Full Duplex Switched Ethernet) and ARINC664 data network on-board of commercial aircrafts, including the Boeing 787 Dreamliner and the Airbus A380 and A400M, has created a need for SNMP Agents and SNMP Managers capable of communications over full feature AFDX® / ARINC664 networks. The task of retrieving, viewing, and analyzing SNMP MIB data from End Systems residing on aircraft data networks is a primary concern to the aircraft developers, airline operators and maintenance teams. To support this needs NuDesign has partnered with the leaders in the field and adapted its SNMP MIB Browser tools, SNMP Agent & Manager development tools, providing them to test departments, and OEM’s supplying the avionics industry with AFDX® / ARINC64 networks and devices. 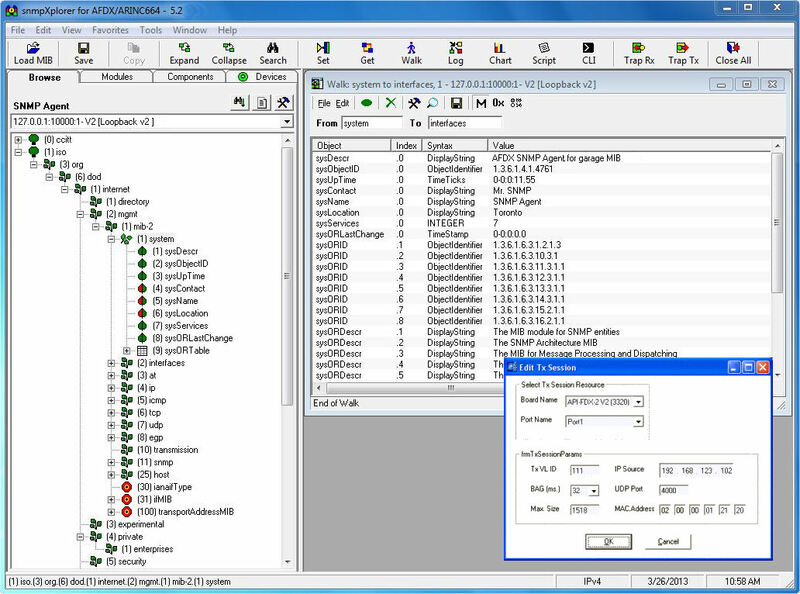 The snmpXplorer combines the robust SNMP monitoring, test and analysis features with industry leading ARINC664 interface modules and complete suite of ARINC664 test and analysis tools. The snmpXplorer is fully compatible with most of our avionics industry partners PCI, cPCI, PCMCIA, and PMC AFDX®/ARINC664 modules. Support for SNMP V1/V2 and V3 management, analyzing, test, configuration and monitoring functions over the AFDX® / ARINC 664 data networks. Simultaneous SNMP communication with multiple agents via user defined AFDX® / ARINC664 Virtual Links. An Intuitive Browse Tree displaying all MIB constructs that have an OID assignment. Automated testing of SNMP Agent MIB implementations – two buttons: one to find MIBs implemented by the agent, second to invoke pre-canned tests that verify accuracy and completeness of SNMP Agent MIB implementation against its MIB document. Enhanced use of Walk, Get Table and Get Row functions with the use of Get Bulk operation that greatly increases the data refresh speeds. Rich alarm handling capabilities: support for different alarm detection algorithms for charts. An import/compile facility for enterprise MIBs including automatic loading of MIB Import dependencies. The snmpXplorer is available for evaluation and purchase from our avionics industry partners, please contact NuDesign or your preferred partner to arrange evaluation package. To support the original equipment manufacturers (OEM’s) producing equipment for avionics industry equipped with SNMP Agents or test departments that need to quickly generate an SNMP Test Agent capable of configuration and communications over the for AFDX® / ARINC64 networks NuDesign adapted its Visual xAgentBuilder for C++, the SNMP Agent code generator to operate over these networks. The developer simply “feeds” the custom MIB into the code generator wizard and gets a fully working SNMP Agent with MIB object methods “stubbed” and ready for instrumentation code or immediately compilable into a working SNMP test / simulation agent. This product operates with AFDX® interface modules that are available for evaluation and purchase from our AFDX® / ARINC664 avionics industry partners, please contact us to arrange for SNMP Studio for ARINC evaluation package. Supported environments include MS Windows, PC Linux and embedded OS / RTOS’es such as MontaVista and SnapGear Embedded Linux, QNX Neutrino®, WindRiver VxWorks, Microsoft Embedded XP and CE.NET and ENEA OSE among others. This SNMP management applications development software provides a comprehensive SNMPv3 functionality for AFDX® / ARINC64 environments. In addition to traditional management functionality, this software provides ability to send and receive all SNMP notifications including traps, v2 traps and informs. All aspects of this software are based on SNMPv3 and AFDX® / ARINC64 specifications. 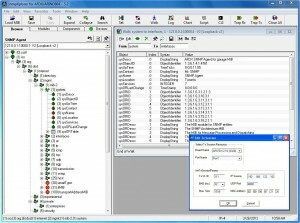 This software is derived from NuDesign’s SNMPv3 management software implementation of an ActiveX Control for Visual Basic and C++ Management Library for C++ applications. The product is directed at developers of management applications for aircraft data networks, and it contains source code examples applicable in SNMPv3 Manager functions. This product operates with AFDX® interface modules that are available for evaluation and purchase from our AFDX® / ARINC664 avionics industry partners, please contact us to arrange for SNMP Management library for ARINC evaluation package.